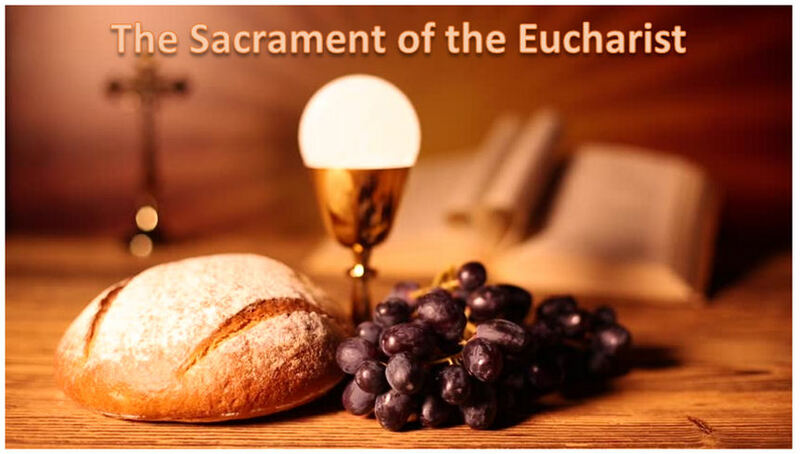 The Eucharist is the “source and summit” of the Christian life (Vatican II, Lumen Gentium). It is the source because the sacrifice of the Eucharist is the Sacrifice of Christ our Savior on the Cross. The Mass is “everything between Holy Thursday and Easter Sunday.” It is the Last Supper of Jesus with his closest disciples in the upper room, in which he told them, “Take this, and eat it, for this is my body.” It is the death of Christ which paid the price of death for our sins, redeeming us and freeing us from the unpayable debt we owe. It is the bursting forth from the grave of the victorious and living Christ, who defeated the Enemy with the very suffering and death he introduced into humanity. It is the restoration of life freed from the shadow of death. And it is the Holy Spirit poured out into the world, empowering the Sacraments of the Church, the human participation in divine life, and the indwelling of the Holy Spirit in the lives of the saints. It is the bond that connects the saints in a communion of divine love lived in human life. The Eucharist, the celebration of the Mass, is the source of the Christian life. It is the summit because it is the communion between God and his people, not just in a personal relationship, but in a nuptial bond. It is the wedding banquet of the Lamb and His Bride, the Church. It is the consummation of divine lover with the human beloved, the communion of saints. It is the heaven that we are made for, that we hope for, and that has been prepared for us. It is a temporal participation in the eternal banquet of joy of heaven. It is the Supper of the Lamb. The Eucharist, the holy body and blood of Christ, is the supernatural food of the spiritual life; it is the summit of the Christian life. Abiding this scriptural junction, the Catholic Church (1) teaches that the bread and wine truly become the Lord’s body and blood, as he said. Also, the Church (2) reserves the Blessed Sacrament from those who do not believe in the real presence of the Lord in the Eucharist, lest they consume unworthily and bring judgment against themselves. But the ancient practice of “closed communion” by the Catholic Church is also an expression of the formal (if not perfect) union of faith and morals of those who subject themselves to the teaching authority of the Church, and the tragic disunion with those who have joined themselves to an ecclesial community that rejects parts of Catholic Church teaching. It would be improper to share the sacrament of communion until we have the reality of communion, in faith, morals, liturgy, and sacrament. That is not necessarily to say that our “separated brethren” in Christ are inferior, but rather simply acknowledges the lack of sufficient agreement to say that we are in full communion. Those who are restricted by dietary needs from the body or blood of Christ may inform an usher before Mass, and there are low-gluten hosts available, if we know in advance to consecrate them (gluten-free hosts are unable to be used in the Sacrament of the Eucharist). Also, the Church teaches that the reception of either Eucharistic species alone, whether just the body or just the blood, is the reception of the full grace of the Eucharist, as the presence of Jesus in the Eucharist cannot be separated. The Body, Blood, Soul, and Divinity of Jesus are graciously present in any discernible quantity of the Eucharist. And so those unable to receive even a consecrated low-gluten host are welcome to receive solely from the chalice of the Precious Blood. Children of our parish receive their First Communion in the second grade. Children are expected to begin preparing in first grade by receiving formal religious education training either through classes on Sunday morning, attending a Catholic school, or being home-schooled with an approved-Diocesan curriculum. For more information, go to Religious Education.